There is recognition among scientists and educationalists that many projects these days cross traditional discipline boundaries. For example, modern microscopy demands high level input from biologists, physicists, mathematicians and computer scientists. We want to give pupils experience of true interdisciplinary working. In conjunction with a Scottish Schools’ Education Research Centre (SSERC) project we have adapted pupils’ smartphones for use as microscopes – using a simple lens system from a laser pen. This will involve S1 pupils in Craft, Design and Technology, Physics and Biology. Biology: Filming cells and microscopic animals. In the image here you can see red onion cells photographed on a mobile phone sitting on top of the home made microscope. Read more about this month’s Rolls-Royce activities here. 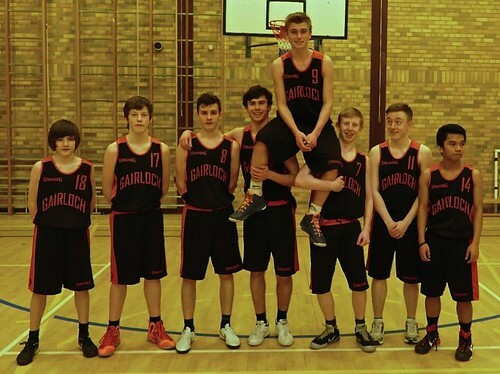 Basketball – Gairloch vs. Invergordon – On Thursday 26th February, the senior boys team beat Invergordon High School. 52 – 27. This was Jordan Gorman’s last game for the school and he rounded it off with a buzzer-beating three-point basket. This senior boys’ team have played together since 2010 and, while we’ll miss Jordan, there’s plenty of talent coming through for the future. As well as representing the school Jordan was part of the U15 Scotland team in 2012/13. He has also played as a member of the Highland Bears and plans to continue training. Jordan has left school to take up a Modern Apprenticeship with the international ICT company ATOS. He will be trained initially at their centre, opened in 2013, at the Forres Enterprise Park. Travel and tourism trip to Dundee – As part of our course we have to look at tourism in Scotland. Dundee was chosen because lots of things are happening there to encourage tourists to visit. We left on Tuesday morning and on the way down we stopped at the House of Bruar which was really interesting as we got a tour from a lady who works there. 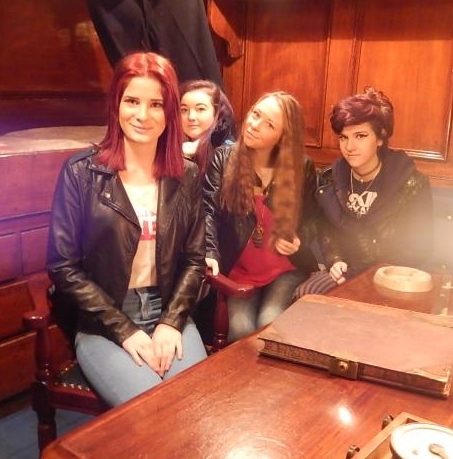 She told us loads about the place and it was so big. We would recommend a visit on the way down the A9 but bring plenty of money! On Wednesday morning we went to Discovery Point. The RSS Discovery is a ship that was built in Dundee and went on an expedition to Antarctica that took three years. Scott and his men studied the climate, wildlife and geology of Antarctica. It was Scott’s second trip to Antarctica on the Terra Nova when he reached the South Pole only to discover that Amundsen had got there first. We got a little talk in the conference room and then we were shown around the ship. It was very interesting but not as interesting as McManus Gallery and Museum that we went to in the afternoon. It had loads to see and was very big and filled with paintings, stuffed wild animals, ancient Egyptian mummies and Roman artefacts and many more things. It was fun to look around. For lunch we visited a small cafe called Madigan’s, which is a lovely place. The person who owns Madigan’s used to live in Poolewe. We were really impressed with the cafe and liked the extra details, like the menus were inside old Blue Peter books. We would definitely recommend the soup! On Wednesday afternoon, we also went to the Visit Scotland Information Centre and got some good information. The lady who talked to us was lovely and very polite and knew lots about the whole area. We stayed at Dundee Backpackers Hostel for the two nights. It was cheap and right in the centre of the city – perfect because all the shops were around us. We all shared a room and had our own bathroom although the shower leaked. We would recommend Dundee as a place to visit for a long weekend because there are plenty of things to see and do, although we were told the nightlife isn’t as good as Aberdeen. We weren’t sure what to expect since one of Dundee’s nicknames is ‘Scumdee’ but would say it was a nice city to visit and we would probably go again. It was a very good trip and we would like to thank Mrs Bulmer and Mr Gibson for organising it and accompanying us. Our pupils came away with a much better understanding of Healthcare Career options. Thanks to Mr Milner for accompanying the girls. Comic Relief 2015 – S6 organised a “Wear something Red” day on Friday 13th March and collected £130 for Comic Relief. You can see photos on the school website. 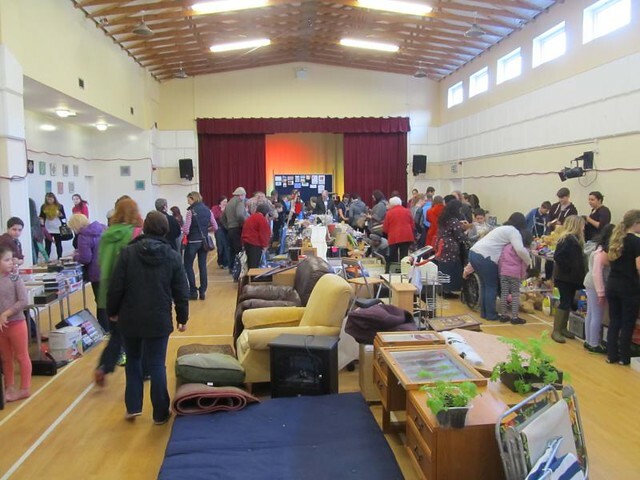 S1 Bring and Buy Sale – We are very grateful for the support of parents, staff, Parent Council, local businesses and everyone who helped on the day, or by providing items for the sale and prizes for the raffle. The event was a great success and the pupils worked hard to raise funds to pay for their activity week in the Cairngorms this May. By the time you read this the total amount raised will have been announced (£2200) on the local radio and on the website. You can also see photos of the event on the website. Thanks to Dr Caley for organising the pupils in preparation for the sale and all the further work involved in making the S1 Activity Week happen each year. Gairloch Pupils involved in Solar Eclipse Research – On Friday 20th March 2015, a total solar eclipse will occur across the far Northern regions of Europe and the Arctic. The longest duration of totality for this eclipse will be 2 minutes and 46 seconds as viewed off the coast of the Faroe Islands. Observers in Gairloch will be treated to a very deep (95%) partial eclipse; while much less spectacular than the total eclipse, this is still a rare and impressive event. The Geography department will be participating in a University of Reading/BBC project during the solar eclipse. The data will be used for a BBC Stargazing Live experiment charting how the eclipse affects weather around the UK. The recent purchase of a Kestrel Weather Meter, as a result of funding from the Rolls Royce Science Prize, has allowed Gairloch pupils to take part in this contribution to international science! 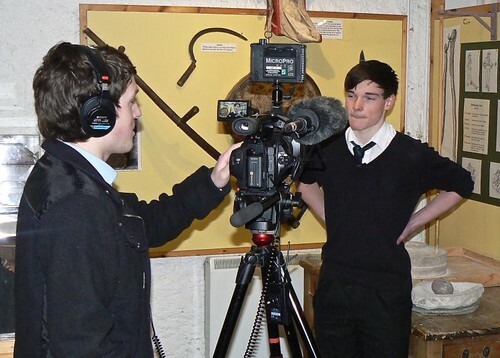 BBC Alba interview – The Gairloch Museum entry for FilmG (in which Iain Nelson, Max Conway and Sorley Street were involved) recently made the competition’s shortlist. BBC Alba was keen to cover this success and to uncover the harsh financial realities facing the museum and documented in the film. Iain Nelson was interviewed by BBC Alba with the news piece then being broadcast on Aithris na Maidne, Aithris na Feasgair and An Là. UKMT Intermediate Maths Challenge – Well done to Mark McLean, S4, for getting the highest score and a bronze certificate in the intermediate maths challenge. Jack Wright was second and the highest placed S3 pupil. Bronze certificates also go to Sebastien Pickering, S4, Leonie Baptist, S3, and Greogor Vickerstaff, S3. Well done to everyone who took part. Arctic Convoy lecture – As mentioned in the last issue of the Gairloch & District Times, Dr Valentina Golysheva gave a talk to S4,5,6 pupils about the need to remember the details and importance of the Arctic Convoys. Dr Golysheva also presented the school with a copy of her book “A Flashback to the Arctic Convoys”. Rolls-Royce Science Prize – The interesting work for this project continues in classes throughout the school. As well as allowing us to take part in the Total Eclipse project mentioned above staff and former pupils have been involved in working with other pupils and staff, not only in Gairloch, but across the UK. Each month we add a report onto the school website and the February edition is available now. Recent Charity Fundraising – Pupils and staff raised £173.79 on Friday 13th February for non-uniform day. UNICEF will benefit from this collection. Retiral – Mrs Nancy Macleod retired on 27th February. Mrs Macleod has worked in the school since 2000 although she worked with youngsters before that in other roles. Staff had a presentation for Mrs Macleod to say thank you for her contribution in supporting staff and pupils over the years. 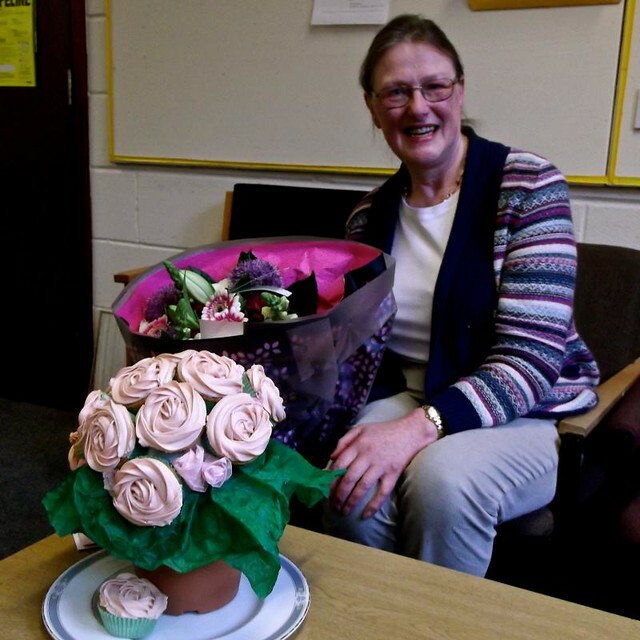 She also received a lovely cake made by Catherine Wyatt (S6) in the shape of a rose bush. Staff and pupils alike will miss Mrs Macleod but we all wish her well as she directs her time to family and other pursuits. 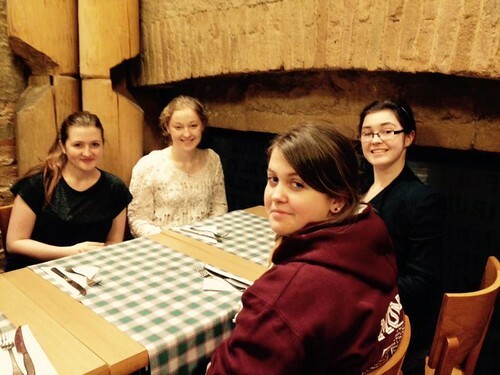 Comenius trip to Spain –Beth Townsend, Eilidh Owens, Deborah Connop and Holly Morrison have returned from their Comenius visit to Spain with Ms Mackison and Miss Hunter. They travelled from Edinburgh via Barcelona visiting The Sagrada Familia en route to Seville. They also visited Gibraltar and Portugal during a hectic week of activities. We will be arranging an evening presentation in the school to share experiences of this trip along with those to Finland and Turkey. The project will culminate in a visit by the other schools to Gairloch in April. 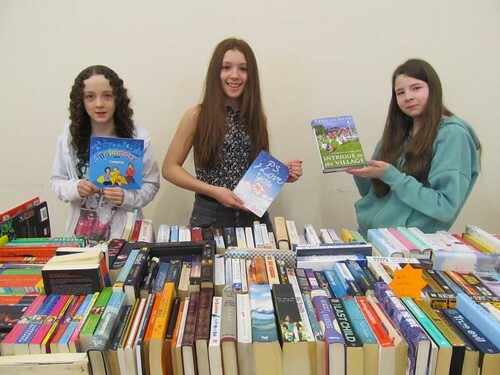 S1 GRAND BRING AND BUY SALE – We are currently taking donations: baking, books, DVDs & CDs, bric-a-brac, plants, electrical items in good working order, toys, clothes in good condition, jewellery, bottles and raffle prizes. The sale takes place on Saturday 14th March – 10am in the Gairloch Community Hall – please support our S1 pupils! Important Date – Thursday 12th March is the S4 Parents’ Evening. Others available on the school website.